An electric knife is a useful kitchen tool whether you need it to carve that Thanksgiving turkey, cut thin slices of roast beef or ham, or cutting a loaf of bread. Many people wonder if it is an item worth purchasing since they may only use it once or twice a year. However, we believe even for a couple of uses a year they are worth it since there are good options that can be found for around $20 and better options that cost a bit more. 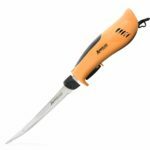 We recommend corded electric models for your primary at-home carving tasks, but if you want to fillet fish then there are some good cordless knives that you can use while fishing. Below we reveal our top 7 choices for the best electric knives and review each one. Our pick for the best electric knife is the Cuisinart CEK-40 which sells for about $42. This corded model provides plenty of power and comes with two different stainless steel blades to handle any slicing task, whether you are preparing a turkey dinner for Thanksgiving or slicing homemade bread. This model does the best job of any on our list at any of those slicing tasks. An ergonomic handle for right or left-handed people and a simple on/off trigger control makes it a breeze to use. The CEK-40 comes with a solid wood butcher block storage system with safety lock to secure the machine, the carving blade and the bread blade. The only downside is that the Cuisinart CEK-40 is a bit more expensive than some electric knives you can buy. The $150 Cuisinart CEK-50 is our pick for the best cordless electric knife. This thing uses two 3.9 volt rechargeable lithium-ion batteries that get a 20 minute run time per charge and take 30 minutes to recharge. This model delivers excellent cutting performance thanks to two different blades – one with a serrated edge for cutting meat and bread, and one with a straight-edge blade designed for cutting vegetables, fruits, and filleting fish. The CEK-50 is comfortable and easy-to-use with a simple one touch on/off trigger operation. It comes with a storage case and AC adapter to recharge. If you need the best corded electric fillet knife then you want the American Angler PRO 32350DS which sells for about $76M. The unit was designed with superior components and precision engineering to make the most powerful and rugged fillet knife. An 8-inch, curved stainless steel blade does the dirty work. No matter what you catch, the American Angler PRO 32350DS will save you time cleaning fish. It was built to handle the toughest species of fish like striper, grouper, catfish, salmon, redfish, and more even when cutting through bones. 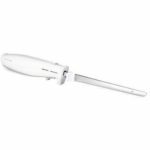 We think the $21.85 Hamilton Beach 74275 Classic Electric Carving Knife provides the best value and is a great choice for most people. 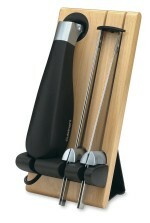 This black with chrome accent corded knife comes with 7-inch stainless steel blades and a carving fork. It has enough power and cuts well enough, but occasionally the blades can bow out a bit and shred or rip the meat. The Hamilton Beach 74275 is very similar to the 74250 (our next choice) with the main difference in the looks and design. We think this model has a better overall design with an easier to use trigger button. The Hamilton Beach 74250 Carve ‘n Set Electric Knife is another good choice for value since it only costs about $18. It has plenty of power with the 100-watt motor and the two serrated, stainless-steel blades saw back and forth to cut nice-looking slices of meat or bread. The biggest complaint from users is that the handle and trigger are a bit awkward to hold and use, which could be a problem if you have small hands. However, if you only will be using this unit a couple of times a year then it is not too big of a deal. Our pick for the best cordless fillet knife is the Rapala Lithium Ion Cordless Fillet Knife which sells for $75. Designed for any filleting task, it features a lithium ion battery that can last 80 minutes without reducing power or slowing down and charges back up in less than 2 hours. It provides enough power and a consistent speed when slicing multiple fillets with the 7 inch stainless serrated blade. For home use we recommend a corded model, but if you are looking for a cordless model for filleting fish then this Rapala unit is as good as it gets. You get what you pay for with the Proctor Silex 74311 Easy Slice. It is the cheapest electric knife on our list at right around $11.50, but it is also the cheapest in terms of quality. User reviews are mostly positive, but several people have complained about the motor overheating easily and then giving out. Some people also don’t like the way the handle and trigger are designed which makes it difficult or uncomfortable to use – especially if you have meat juice on your finger or arthritis in your hand. When it is working, the stainless steel blades do a decent job of slicing through meat, cheese, and breads and believe it or not one of the most popular uses of this electric knife is cutting foam. However, it does have some problems with soft breads. That reliability knocked down the rating from us, but at this price you can’t really complain too much.